You might think micro-precision sandblasting, or MicroBlasting, is an unlikely tool for coating removal on static sensitive circuit boards and electronics. You might expect all that dry air and abrasive to kick up a spark, create a mess, or mar delicate compositions. However, with the right adaptation to your equipment, you can greatly reduce the risks associated with ESD. MicroBlasting provides a gentle, precise and controllable approach to selectively remove parylene, epoxy, polyurethane, silicone, acrylic and more without danger. 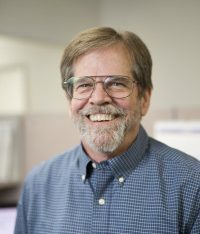 In the mid-1970s, we began designing ESD control workstations to accommodate static-sensitive applications. 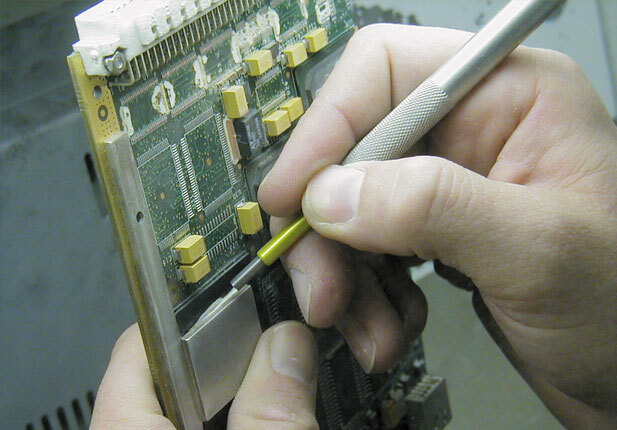 Four decades later, we adapted our compact and efficient all-in-one blasting center for conformal coating applications. The result is the CTR201 ESD Control ProCenter Plus™. The Ionizer Bar floods the entire work chamber with ionized air to neutralize static build-up. Built-in sensors monitor the effectiveness of ion flow and indicator lights alert the operator to any changes in ion levels. Needle Probe pierces through the conformal coating to ground a target trace. Edge Grounding Bar grounds all edge pins on boards with edge connectors. Grounding Jacks in the blast chamber provide convenient connection points for wrist-stats, edge grounding bar, and needle probes. 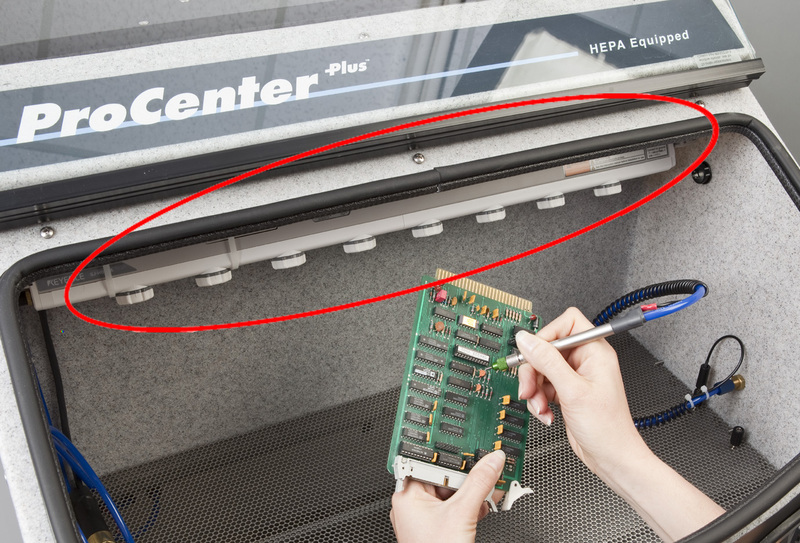 The Ionizer Bar (circled in red) floods the entire work chamber with ionized air to neutralize static build-up. This short video shows conformal coating removal using our AccuFlo® MicroBlaster and the ESD Control ProCenter Plus™. Would you like to try MicroBlasting on your CCR application? Or just curious about our equipment? Email me or give our Technical Sales Team a call at 1-800-796-6626.